Lazy loading in angular is introduced to load the source and pages on demand. Concept is to group the feature in modules and when user load any page from that module, load the complete module only then rather than to load everything on application start. Let's try to understand the concept with example: Say we have a website which have users, customers, products etc. For lazy Loading, we will keep all the users related information in Users module, similarly for the customers and products. When user will hit the home page, only basic information will be loaded and not the user, customer and product. When user will hit any page from any module that module will load at that time. Similarly we will do for anyother modules, products. I used-to to create components folder and keep all the compnent in that. It is not mandatory so we will not discuss that but you will not that folder in different places. Let's create the customer module, Customer List Component: We will use hardcoded list of customers for example otherwise it need to come from database through server. Template for Customer List, to show the list of customers. Note the router-outlet, we need it to render the child component in it. Nitll now there is nothing special about lazy loading, we just created three components in angular 6, so no need to explain any thing. In this module we will use RouterModule.forRoot(mainRoutes), note forRoot inplace of forChild which we used in our lazy loading module. Note we are not importing or decalring any module or component from the lazy loading features, just the appComponent to bootstrap the application and AppRoutingModule to load the basic resources. I used here buttons for exmaple, you can create a separate navigation component for top menu and use what ever html elements you want and import that. Note the router-outlet to render the rest of the pages and menu will be as it is. Greate everything is working but I missed the bootstrap file to include. There are two way to use the bootstrap, either by using the CDN or by installing it. We added two modules 1. Customer and 2. Products, we completed for customers so now we will create together complete products lazy loading module step be step and will practice it. Create a new folder products inside components folder. 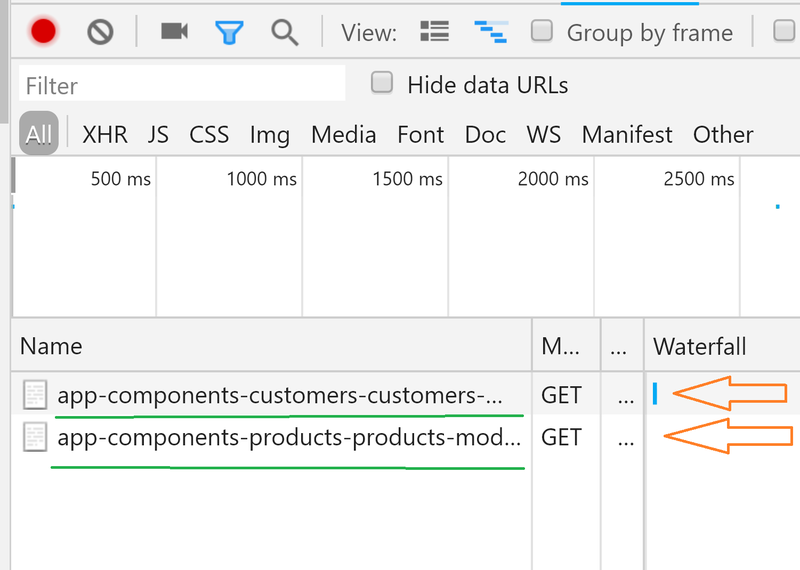 Create a dummy list of products say productList: Array = [...] and adjust the html to show the list in tabular format, see customer list code. Similar to product list create product detail page and read the id from route and select a product from your dummy list ( you need to copy the dummy list here as well). One more file we need to add in this module call product.module.ts, create it by running the command ng g module products --flat. After creating it, import our ProductRoutingModule and pass that in imports.